Setting the Bar High: Brad Gusler has driven the fastest trucks in NMRA, so at first, jumping behind the wheel of a four-cylinder Mustang might not have seemed all that appealing. When the four-cylinder turbocharged EcoBoost engine was introduced to the Mustang for 2015, Mustang purists were not pleased. Could a four-cylinder engine really do the job in the ultimate American muscle car? 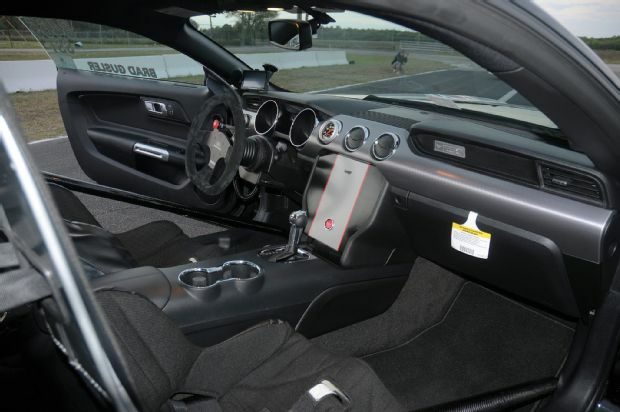 Brad Gusler’s EcoBoost Mustang is answering loud and clear: Yes, it can. Brad and Nina of Big Island, Virginia, are well known on the National Mustang Racers Association (NMRA) circuit, most commonly for their incredibly fast Ford Lightnings. As such, Brad has quite a few friends in the industry who helped direct him toward the underdog EcoBoost Mustang when it hit the showroom floor. So Gusler took a chance, purchased his 2015 in January, and made a phone call when he got it home. In three days it was on its way to Watson Racing to begin its transformation into an NMRA killer. Gusler had seen Watson Racing’s S550 at the 2014 SEMA, and knew they would be able to help him get his EcoBoost on track quickly. When we first saw it on the track at the NMRA Spring Break Shootout event in Bradenton, Florida, in March, it had just over 100 miles on the odometer and was breaking necks left and right. 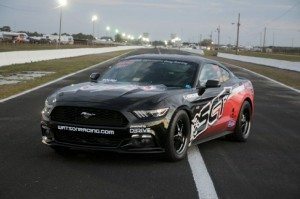 Gusler competed in the Super Stang class and left the event with an 11.77-second pass at 117.6 mph under his belt, but that wasn’t quick enough. You must be wondering how they did it. 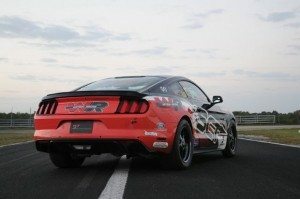 How did Gusler and his team take the underdog EcoBoost Mustang and turn it into the beginnings of a track terror? An Aeromotive Cobra Jet fuel pump operates within the Aeromotive fuel cell to deliver adequate Fuse unleaded 116-octane nourishment to the powerplant. A JLT cold air intake helps pull air to the Precision Turbo 55mm turbocharger and CP-E manifold, which was custom-designed for the application by Custom Performance Engineering of Beltsville, Maryland. It is also outfitted with a custom air-to-water intercooler from Justin’s Performance Center (JPC) of Millersville, Maryland, and a custom JPC Racing 3-inch exhaust with Bassani muffler. The Mustang retains its stock automatic transmission, and a Dynatech one-piece aluminum driveshaft is wrapped securely in place by a Watson Racing safety loop. Helping to launch the Mustang well into the 11s are Strange Engineering front struts and springs, a Watson Racing tubular K-member, solid engine mounts, and tubular A-arms, as well as Strange Engineering rear shocks. The independent rear suspension has been strengthened with Ford Performance Racing Parts gear. 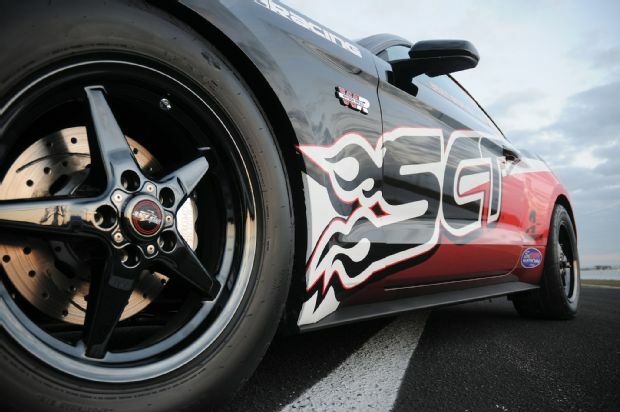 The final combination was custom-tuned via an SCT Livewire TS Performance programmer. Race Star wheels are wrapped in Mickey Thompson rubber, which are brought to a halt at the top of the quarter-mile by Aerospace Components drag brakes with Watson Racing stainless steel brake lines. The striking custom wrap was designed and installed by Creative Edge Design in Altavista, Virginia. A Watson Racing six-point rollcage with a carbon fiber finish keeps Gusler safe as he careens down the 1320 securely strapped into Kirkey racing seats with Watson Racing mounts and RaceQuip harnesses. An Auto Meter in-dash gauge helps him keep track of what’s going on under the hood.